The connections to the SRF01 are shown below. If you're using multiple SRF01's, you can connect them all up to the same serial port on your controller. Just make sure all the SRF01's are programmed to different addresses. There is a weak pull-up resistor (47k) to 3.3v on the module, to pull the Tx line up to a logic high level when none of the SRF01's are transmitting. To send a command to the SRF01, you need to send a "break" followed by two bytes. The first is the SRF01's address 1 to 16, (0x01 to 0x10) and then the actual command itself - see below. There are two commands to initiate a ranging (80 to 81) giving results in inches and centimeters. These two commands don't Transmit the result back to your controller. You should wait 70mS and then use command 94 to get the result of the ranging. Another set of two commands (83 to 84) do the same, but also transmits the result of the ranging back to your controller as soon as it is available. Together, these four commands (80,81,84 & 84) are called "Real" because they perform a complete ranging. There is another set of four commands (86, 87, 89 & 90) called "Fake". 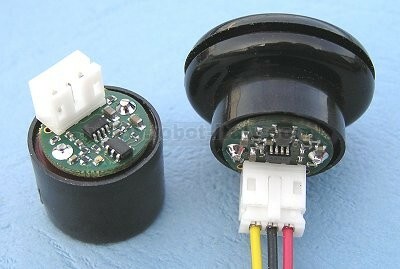 They are the same as the "Real" commands except that they do not send the 8-cycle ultrasonic burst out. These are used where the burst has been transmitted by another sonar. It is up to you to synchronize the commands to the two sonar's. There is a command (92) to transmit a burst without doing the ranging. Command 93 is used to get the firmware revision of the SRF01. Command 95 gets the status byte. Bit 0 is the "Lock" bit. 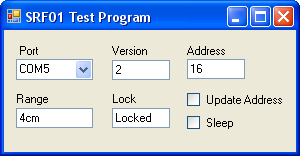 it is low (0) after power up, after the "Unlock" command is executed and after the module exits sleep mode. It goes high after 6 rangings have been completed with at least 30cm of free space in front of the sonar. See Advanced Mode for more details. Command 96 is used to place the SRF01 in a low power sleep mode. See Sleep Mode for more details. Commands 98 & 99 are used to enable/disable Advanced Mode. 83 0x53 No Real Ranging Mode - Result in inches, automatically Tx range back to controller as soon as ranging is complete. 84 0x54 No Real Ranging Mode - Result in centimeters, automatically Tx range back to controller as soon as ranging is complete. 89 0x59 No Fake Ranging Mode - Result in inches, automatically Tx range back to controller as soon as ranging is complete. 90 0x5A No Fake Ranging Mode - Result in centimeters, automatically Tx range back to controller as soon as ranging is complete. 94 0x5E No Get Range, returns two bytes (high byte first) from the most recent ranging. 95 0x5F No Get Status, returns a single byte. Bit 0 indicates "Transducer locked", Bit 1 indicates "Advanced Mode"
96 0x60 Yes Sleep, shuts down the SRF01 so that it uses very low power (55uA). 97 0x61 Yes Unlock. Causes the SRF01 to release and re-acquire its "Transducer lock". Used by our factory test routines. 98 0x62 Yes Set Advanced Mode (Factory default) - When locked, SRF01 will range down to zero. None of the commands which return data can use address 0. That would mean SRF01's trying to transmit data at the same time, and is prevented. Most commands which do not return data are allowed to use address 0. Exceptions are address change commands. The advantage of allowing address 0 access is that by sending a ranging command such as 0x51 (81 decimal), all SRF01s will start ranging at the same time. After 70mS, you can then get the results from each SRF01 at its own address. The Led gives a brief flash during the "ping" whilst ranging. If the transducer has not locked, the Led is on with a brief flash off. If the transducer is locked, the Led is off with a brief flash on. 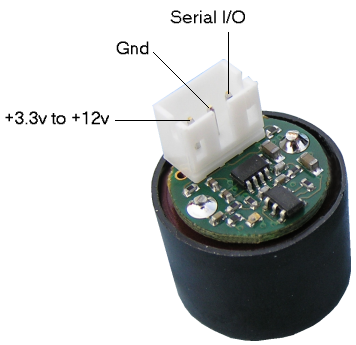 If you power up the SRF01 without sending any commands, it will flash its address out on the LED. One long flash followed by a number of shorter flashes indicating its address. The flashing is terminated immediately on sending a command sequence to the SRF01. This is the factory default mode. In this mode it is possible for the SRF01 to measure range all the way down to zero. Initially, the minimum range the SRF01 can detect is around 18cm or 7 inches. For the SRF01 to be able to measure all the way down to 0cm, it acquires a precision crystal lock on the transducer's characteristics. This happens after 5 rangings have been completed with 30cm or more of free space in front of the sensor. When this happens the "lock" bit is set (bit 0 in the status byte) and the SRF01 can measure from 0 to 600cm (0-6meters). During operation the SRF01 maintains the transducer lock automatically, provided it gets an occasional (every few minutes) set of 5 consecutive rangings of greater than 30cm. The "lock" state of the SRF01 can be checked in by reading the "Lock" bit, which is bit 0 in the status register. A high (or logic 1) indicates transducer lock has been achieved and the SRF01 will work down to 0cm. Where the SRF01 is not able to maintain its lock, it will release it (lock bit = zero) and re-acquire it as soon as possible. We have a small test program, written in C# which controls the SRF01 via the Acroname S22 module. A small schottky diode is used to prevent the SRF01 trying to drive the S22's output line (data from the PC). You will need to download and install the FTDI VCP drivers to use the S22. The complete project directory, with all source files, can be downloaded here. To use this program you should download and install Microsoft Visual C# 2008. 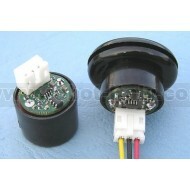 A rubber grommet is supplied to mount the SRF01. To use this make a 20mm cutout in your panel and fit the grommet. The SRF01 will then snuggly push into the hole in the grommet. Maximum panel thickness is 1.7mm. Further examples of using the SRF01 can be found on our examples page.